The State Board of Education (SBOE) met last week for four days. As you will see below, they spent quite a bit of time on textbook issues. The board will attend an October workshop to further discuss. 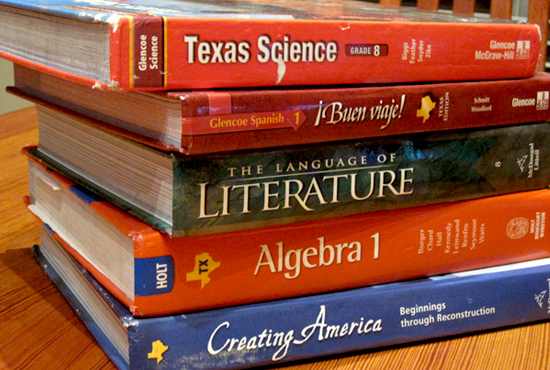 The SBOE approved the TEKS four years ago, but is just now adopting instructional materials. In addition the SBOE chose not to veto the 5 charter schools that Commissioner Williams approved last month, and they agreed to create a committee to develop a long-range plan for public education. 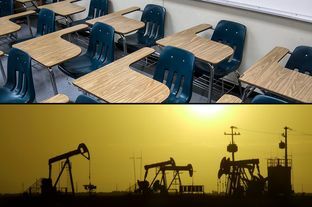 Several academics on Tuesday pointed to flaws — including inaccurate descriptions of world religions and out-of-date racial terminology — in proposed social studies textbooks up for adoption by the Texas State Board of Education. “I believe students will believe Moses was the first American,” after reading the new texts, Kathleen Wellman, a former chairwoman of Southern Methodist University’s history department, told the board on Tuesday. Too much negative about former President George W. Bush, too much positive about Hillary Rodham Clinton and way too much coverage of Moses. Those were among a long list of complaints — from both sides of the political spectrum — during an all-day hearing Tuesday in front of the State Board of Education on new history and social studies books for Texas public schools. Reviving a four-year controversy over what Texas children should be taught about Islam, capitalism and the role Judeo-Christianity played in the country’s founding, about 50 people testified Tuesday to the State Board of Education about proposed social studies textbooks. The first textbooks to be adopted by the state board since 2002 have been criticized by some scholars as biased and misinformed. 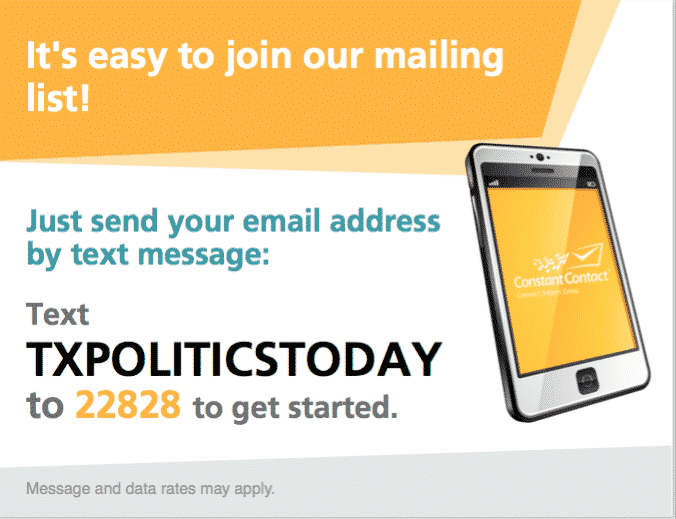 Others warned that those complaints are based on an anti-American, anti-Christian agenda. Texas education officials took an initial step Thursday toward asking the state to reconsider raising the minimum college GPA needed for prospective educators to enter certification programs. “A little nod … saying ‘we know you can do it, and we support you in this’ would be a positive thing,” said State Board of Education Chairwoman Barbara Cargill, R-The Woodlands, who added that the change would help restore “pride and value” to teaching. Commissioner of Education Michael Williams announced today that the Texas Education Agency (TEA) has identified 11 campuses across the state to take part in a best practices case studies project. Each of the 11 campuses were designated by TEA as High Performing and High Progress Title I Reward School. All have proven successful in classroom efforts on campuses with a high percentage of students from economically disadvantaged families and high mobility rates. A program that would allow high school students in the Dallas school district to get a diploma in three years and use the savings to fund full-day prekindergarten classes won enthusiastic approval from the State Board of Education and Commissioner Michael Williams on Wednesday. The plan, which the Legislature authorized in 2013, will be offered initially to ninth-graders at all Dallas high schools this year. Students who participate will meet the same graduation requirements as other students, but be allowed to finish in three years by earning course credits in summer school and taking some high school classes in middle school. As this Permian Basin city continues to thrive amid an oil boom transforming the region, local drilling companies have faced challenges in recruiting workers to come to West Texas. But the local school district plans to implement a program that could provide a homegrown solution to those labor concerns. In one classroom monitored by security cameras, third- and fourth-graders read in Spanish from a short story about mice. In another, an algebra teacher reminds high school students to always fully distribute both sides of an equation before solving it. On an artificial turf soccer field in the courtyard, seventh-, eighth- and ninth-graders are in the midst of a raucous kickball game — ignoring the high walls and surrounding 15-foot gate. At least 10 Texas school districts have received armored plating, tactical vests, military vehicles, rifles, pistols and rounds of ammunition through a federal military surplus program. 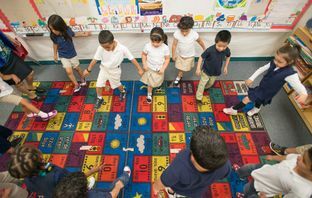 IDEA Austin, one of the area’s newest charter schools, is moving forward with an aggressive growth plan that includes two additional campuses in two years. The charter plans to open a new school next August with 450 students. The campus will be located off Rundberg Lane, just west of I-35 in North central Austin. It’s one of the Austin district’s most overcrowded areas and near an area targeted by other charter operators. IDEA Austin plans to open a third campus one year later with another 500 students on a 16-acre tract in Southeast Austin. By 2022, IDEA says the three campuses will serve a combined 4,200 students. A former Texas lawmaker said Monday that Dallas ISD is breaking the law if it lets students with excessive absences graduate without making up class work. A 2007 law by Scott Hochberg allows principals to create plans for passing students to complete missed coursework to get class credit. But a Dallas ISD audit found few schools documented whether students did the work. TEA has posted first draft recommendations for additional courses for the career and technical (CTE) Texas Essential Knowledge and Skills (TEKS) review. The recommendations, along with recommendations for all CTE courses, are available on the TEA website for informal public feedback. As new standards from the U.S. Department of Agriculture’s Smart Snacks in Schools program go into effect, student-managed stores are discovering that replacing junk food with healthier options is easier than expected. 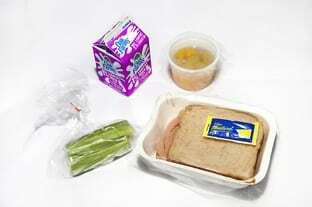 Choices such as whole-grain pretzels and bagels, baked chips and low-calorie drinks strike abalance between meeting federal guidelines and appealing to students. This fall, school districts in Bexar County are taking an unprecedented step in decriminalizing truancy and focusing on getting students back in the classroom, where they belong The plan, which has been in the works for several months, is aimed at keeping students on track to graduate while minimizing school districts’ loss of state attendance funding. State Of GISD Bob Morrison Garland ISD Superintendent Bob Morrison speaks at the Rowlett Chamber of Commerce luncheon about changes in the school district such as art classes added in the elementary schools and iPads distributed to teachers for use in instruction. Never mind that Bob Morrison has been on the job for more than 18 months.